Yay…another two good cross stitching night!! Last night I worked on Woodland Fairy and actually felt like I was finally making good progress on her. I had a really difficult time putting her away this afternoon and actually took an extra 30 minutes to finish up the color I was working on. Here is this week’s progress. Tonight I made some good progress on White Wedding. I am planning on working on it some more tomorrow night so I will post a pic then. I also started a little on Brightneedle’s My Ladies Needlecase. Tomorrow night is the first of three online “session” for that class. I am not sure what those “sessions” will entail, so it will be interesting to see what is waiting for me after my work class tomorrow night. 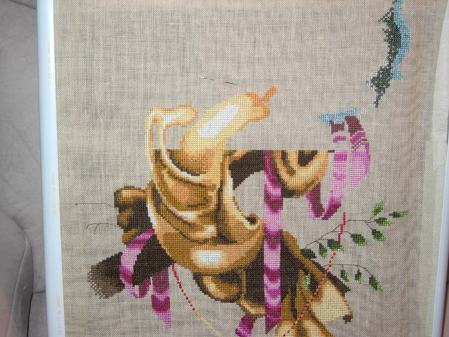 This evening, I did some more basting and started on the border of one of the needlebooks. The silks that were included in the kit are soooo pretty and I am really liking stitching over one. Working on this makes me want to start one of my other Brightneedle patterns, but Allen seems to think I need to cut back on the starting of new projects. On the Allen front, he is actually sitting next to me cross stitching. A few years ago he stitched a grape pattern for our grape themed kitchen and did a great job on it. Shortly after he finished that he started a lighthouse pattern, but it got forgotten when we moved. Tonight, he asked if he could try stitching on my Brightneedle piece, but decided against it when he saw it was over one. Instead, I fished out his old lighthouse and he has been working on it for about an hour. I am so proud:) He even said that I can post pics of his progress. Other good news on the stitching front….I think I got into the Liz Turner Diehl class that I had applied for at the Hershey CATS convention. There was a charge for the right amount from CATS on my charge card, so I am taking that as a good sign. I am very excited!! Wow, you are zipping along on your projects at the moment – it’s great to see! Thanks for the tip about Gordianus, I will have to look out for him. I also have woodland fairy in the works for my daughter but haven’t gotten very far.